APPSC Mains Exam 2019. There are total 18 TPBO Carry Forward vacancies are in this APPSC recruitment 2019. Degree or Diploma in Civil Engineering or B.Tech Planning qualified candidates are eligible to submit online form for this TPBO jobs. Last date to apply online for TPBO job is 13/03/2019. Official website to apply online for this APPSC is www.PSC.ap.gov.in. This Town Planning Building Overseer recruitment of APPSC exam will be conducted on 21-05-2019. 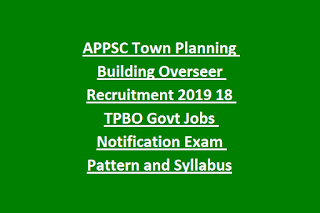 TPBO vacancy details, age limits, TPBO qualification, exam pattern and syllabus, and how to apply online and other details for APPSC Town Planning Building Overseer (TPBO) jobs recruitment exam 2019 notification is given below. Diploma in D.C.E./ L.C.E./L.A.A or Civil Engineering or Planning or Degree in civil Engineering or Architecture or Planning. For TPBO posts age limits as on 01-July-2019 is 18-42 Years. For SC/ST/BC 47 years. Selection for this APPSC Town Planning Building Overseer recruitment 2019 will be through single stage written exam only. Written Exam will be conducted for 300 Marks. Application processing fee is Rs.250/- for all candidates and Exam fee is Rs.80/- for General candidates. No Exam fee for SC/ST/BC candidates. Apply online through official website of www.PSC.ap.gov.in from 12-12-2019 to 02-01-2019. TPBO Exam Admit Card, exam syllabus and pattern exam result and other info is available in this website only. Click here to apply online for the ANDHRA PRADESH PSC Town Planning Building Overseer Recruitment 2019. 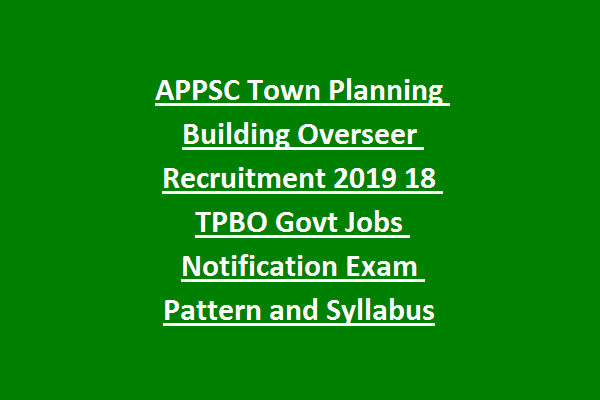 Please share this ANDHRA PRADESH PSC Town Planning Building Overseer (TPBO Recruitment Exam 2019 article to your friends via social pub sites such as whatsapp. Facebook, Google Plus and Twitter.